Ellen Madie is a gender free clothing brand by Nicky Madie . He named his brand to honour his late Mother (Ellen). Ellen Madie was established in 2015 based in Johannesburg. Nicky Madie was born in Klerksdorp ( North West),I came to Johannesburg to pursue fashion and I went to study clothing production at Central Johannesburg College . The brand’s aim is to emphasize androgynous with no limitations to gender, aiming to break free from standard norm menswear , through breaking taking works aimed at awe and igniting creativity. We believe imperfect is the new beauty in fashion . Ellen Madie has shown in Soweto Fashion Week in 2016 and South African fashion week in 2017 and 2018 respectively . 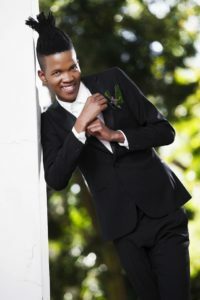 Ellen Madie’ s debuted collection at SAFW has been featured in South African leading Magazines like Destiny Man Magazine X 2 and 1 X People Magazine .